​Mohammad Ali Kadivar is an Assistant Professor of Sociology and International Studies at Boston College. 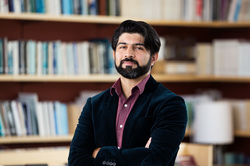 He holds a PhD in Sociology from the University of North Carolina at Chapel Hill, and earned a MA and BA in political science from University of Tehran in Iran. From 2016 to 2018, Kadivar was a postdoctoral fellow at Watson Institute for International and Public Affairs at Brown University. His work contributes to political and comparative-historical sociology by exploring the interaction between protest movements and democratization. This work grows out of his experience as a participant-observer of the pro-democracy movement in Iran, but his research agenda moves outward from this case to explore these issues on a global scale, using case studies, comparative-historical methods, and statistical analyses. Kadivar’s research has been published or is forthcoming in the American Sociological Review, Social Forces, Comparative Politics, Socius, and Mobilization, and has won awards from the Collective Behavior and Social Movement (CBSM), Comparative Historical Sociology, Global and Transnational Sociology, Sociology of Development, and Peace, War and Social Conflict sections of the American Sociological Association (ASA).